usanna Newton Hilliard was born in England and raised in the Boston area. Her musical training began at the age of seven with the recorder. At eleven, she switched to the oboe. In high school, Susanna performed with both the New England Conservatory Youth Orchestra, under the baton of Benjamin Zander, and the Massachusetts Youth Wind Ensemble (M.Y.W.E. ), under conductor Frank L. Battisti. In 1976 she had the honor of touring Russia with M.Y.W.E. It was at the age of 15 after attending the “Apple Hill” music camp in the New Hampshire countryside, that she was inspired to pursue a lifelong career in music. Susanna received her Bachelor’s Degree in Musical Performance from the New School of Music in Philadelphia. She was the recipient of a full merit scholarship during her last three years and, upon graduation, of the prestigious Robert Montgomery Memorial Award for leadership. In Philadelphia, she studied with Philadelphia Orchestra Assistant Principal Oboist Stevens Hewitt and English Horn Player Louis Rosenblatt. 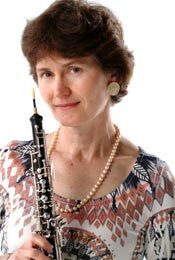 She played numerous chamber music concerts as a member of a student-organized oboe quartet and performed in several local symphonies soloing twice in 1978 and 1979. In 1983, Susanna met her husband, a French horn player, at the Grand Teton Orchestral Training Seminar in Wyoming, where she studied with Eric Barr of the Dallas Symphony. She then traveled to Los Angeles, California, where she played with the Desert Symphony, the Peninsula Chamber Orchestra, and the Glendale Chamber Orchestra. Subsequently, she won a one-year position in the National Orchestra of New York in Manhattan, where she studied with Elaine Duvas, principal oboe of the Metropolitan Opera, and also performed with the New Amsterdam Symphony. During the next few years, while traveling at home and abroad, Susanna played in ensembles and orchestras in Boston, Los Angeles, and Florence, Italy. Her performances in Florence included the chamber groups Solisti a Fiato di Firenze and Solisti dell’Ensemble Cameristico Pistoiese, and a unique recital at the historic Villa Corsi Salviati in Sesto Fiorentino. In 1994, Susanna and her family—which now included two sons—moved to North Texas, where she launched her teaching career. She currently has a studio of more than 45 students a week, and plays oboe and English horn regularly in three symphony orchestras: the Irving Symphony, Plano Symphony, and San Angelo Symphony. Susanna is the co-founder, with Iris Messinger, of the chamber music ensemble Mélange Musical. r. Iris Messinger has achieved recognition as a performer both in the United States and abroad. Currently an active musician in the Dallas-Fort Worth Metroplex, Dr. Messinger performs with numerous chamber ensembles and orchestras including Dallas Opera, Fort Worth Symphony and the Texas Chamber Orchestra. She has toured in Europe, North America and the former Soviet Union and has performed in such halls as St. Martin in the Fields in London, Opera de Bastilles in Paris, the Glinka Hall in St. Petersburg and the White House in Washington, D.C. Dr. Messinger has also appeared in a televised performance with Don Henley on the A&E channel and has performed in live broadcasts for WRR 101.1 FM “Classical”, Estonian TV and Georgian TV. Dr. Iris Messinger’s career in music began in her native country of Estonia. There she began her string studies in violin at the age of 7. After graduating from the Tallinn Music High School, she pursued and received her Diploma in Viola Performance from Tallinn Conservatory. While at Tallinn Conservatory, Dr. Messinger earned her conservatory’s most prestigious string scholarship award, the Johannes Paulsen scholarship. In 1990 Dr. Messinger was chosen to represent Estonia in the German-Scandinavian Orchestral Festival in Berlin. Already as a student, she regularly performed with the Estonian Symphony Orchestra. She appeared in many broadcasts on Estonian radio and television and also recorded for the Melodija label with the Estonian Chamber Orchestra. In addition to her work with orchestras, she was active as a chamber musician. 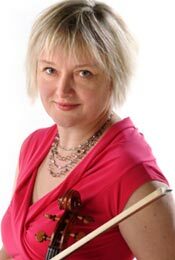 In 1991, performances with the Estonian String Quartet brought her to the Unites States, where she was awarded the Meadows Scholarship to continue her studies at the Southern Methodist University. There she earned both an Artist Certificate and a Master of Music degree. In 1995, Dr. Messinger continued her studies at the prestigious Eastman School of the music of University of Rochester as a candidate for the degree Doctor of Musical Arts in Viola Performance and Literature, where she received the Virginia Majewski and Suzanne Rosenblum viola scholarship awards. Dr. Messinger’s teaching experience spans almost 20 years, with her initial teaching assignment as a student teacher at Tallinn Conservatory in 1989. In 1990 she began her own private studio in Tallinn, Estonia and since that time she has served as a teaching assistant at both Eastman School of Music and SMU and has maintained private teaching studios in Dallas and Rochester. In 1998-2001 she was a member of the Adjunct Faculty at Brookhaven Community College in Dallas, Texas. Dr. Messinger credits much of her teaching ability to the highly esteemed teachers with whom she had the privilege to study. Those instructors include John Graham, Barbara Hustis, Arvo Haasma and Maris Uffert. A musician with a broad knowledge base and eclectic musical and cultural tastes, Dr. Messinger also enjoys learning and speaking different languages. These combined traits have made her sought after as an editor, translator and opponent for dissertation boards at European music academies. She is also a co-founder of the non-profit chamber music organization Mélange Musical. Click here to read about our other players.